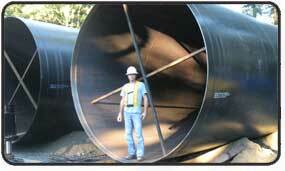 The system is aimed at long and large diameter installations, and suitable for large culverts (up to 16 ft in diameter), fish-bearing creeks, pedestrian underpasses, or utility tunnels. The actual installation times for such installations are measured in hours and days when using the HPD method, rather than weeks and months. The system incorporates a hydraulically charged, fully enclosed driving device with a compressed nitrogen chamber that is fired internally. Also, by using specially designed seals for both the interior and exterior of the pipe, the system has proven itself capable of driving under and/or through the water table. Because of this feature it is even possible to construct outfalls through rough surfs with this system. The system’s main advantage over other methods is the fact that the energy is transferred directly into the casing by means of an ultra-high-energy, low-frequency impact with an immense high-velocity acceleration [up to 1800G’s], which causes the soil particles to be forcibly sheared. 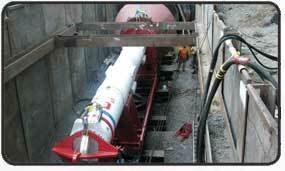 This is not the case with pipe-jacking systems that use low-energy, high-frequency pneumatic rammers. With those systems the soil particles are simply brought into suspension, causing a reduction in friction that in turn increases the effect of the jacking forces. Furthermore, those systems require huge thrust blocks, and their capacity is ultimately limited to the resistance mobilized by the thrust block. The HPD method does not require a thrust block or a ballast foundation since it moves the casing with the fully enclosed driving device. Typical ramming installation systems on the market also require removal of the internal soil plug every time casing is added to reduce friction, resistance and weight inside the pipe. Obviously this requirement affects the efficiency. The HPD™ method does not require these interim removals: the soil plug is removed upon completion of the drive by using a modified Tunnel Digging Machine [TDM] with a telescoping, 360 degree rotating boom with bucket. Through an internal conveyor belt, loaded at the front of the machine with the bucket, soil is discharged at the back to a stacker conveyor belt. 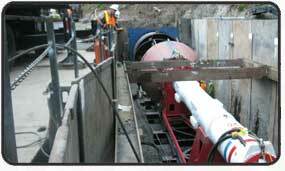 This discharge belt fills up multiple muck cars that are hauled out of the tunnel by an electric train. During the extensive development period, wave-equation software, commonly applied by geotechnical engineers for deep foundation design, was modified for horizontal use. PDA [Pile Driving Analysis] systems, as marketed by PDI and Profound, were used to gather actual information at various test installations that confirmed the design calculations. This demonstrated that every large horizontal casing installation can be accurately engineered, eliminating guesswork and assuring success in any specific installation. 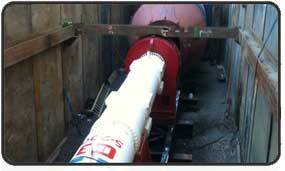 This is not the case with pipe-jacking systems as demonstrated by the many installation failures. The engineering program will determine the driver size, and calculate the settings of stroke and the level of energy to be delivered to successfully perform the particular installation. 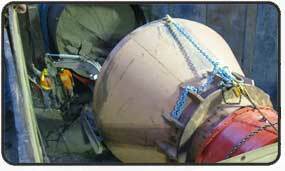 Variables such as the weight of the casing and soil characteristics are taken into consideration. The program will also calculate the net driving time. The HPD system has a built-in computer with printing capabilities that will document various important parameters of the installation, allowing instant comparison of the planned performance (as developed during the engineering phase) with the actual performance.